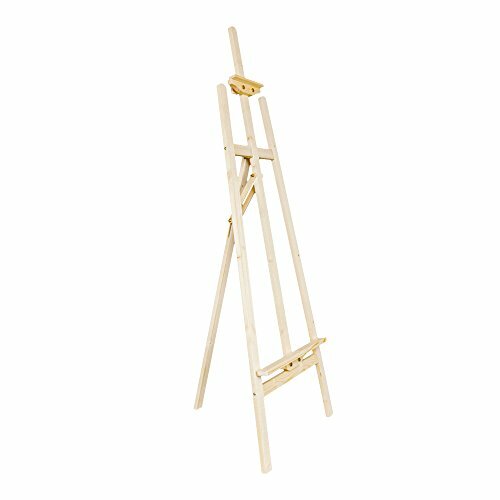 Mallmall 57 inch Tall Natural Wood Adjustable Tripod Art Easel, Presentation Display Stand by Mallmall at Designers Artists. MPN: MM-0000014. Hurry! Limited time offer. Offer valid only while supplies last. Features: 1. Wide application and strong applicability 2. Great for artists and students who enjoy drawing and painting outdoors and in the studio 3. ◆Wood grain texture looks more natural. ◆Tripod design folds flat for easy storage. ◆The maximum adjustable height of the upper and lower head restraints is 108cm as required. ◆It's perfect for home or studio use.Perfect for art displays, storefront signs, presentation materials, and more. If you have any questions about this product by Mallmall, contact us by completing and submitting the form below. If you are looking for a specif part number, please include it with your message.